It is a long road from a rough neighborhood in Savannah, Georgia to the executive suite, but that’s Chantel Lewis-Cummings’ path. When she was just two years old, Chantel’s father was killed. She moved in with her grandmother in Savannah. A few years later her grandmother’s health began to decline and she lost her job. With no income, they were evicted and had to move into Chantel’s great-aunt’s basement. That was when Chantel’s mother, who had been away at school, moved home to help care for her mother and child. It soon became clear that grandma was not going to fully recover, so when Chantel was a high school sophomore she began working to help support her family. 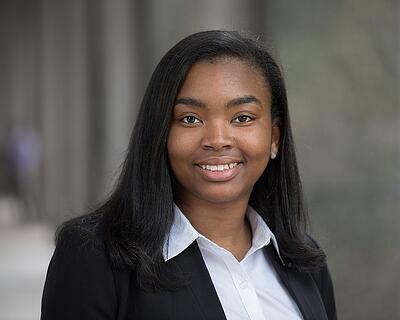 She was fortunate enough to discover the Workbase Learning program through her school, which provided her a paid internship at Gulfstream Aerospace. Chantel took classes in the morning and worked the second shift in the plant. Her experiences at Gulfstream Aerospace inspired her desire to someday become a CEO for an aerospace or car company. “I always wanted to go to college,” Chantel said. “I wanted to do things for myself and be independent, but where I’m from no one leaves or ventures out.” In Chantel’s neighborhood, the community doesn’t readily accept ambition in students. “People always ask, ‘Do you think you’re better than us? '” Chantel said. Disparaging comments didn’t stop Chantel from going after the life she wanted. The only support Chantel needed was from her mother and grandmother—both of whom wanted an education, but neither of whom had the chance to finish their programs. Despite their encouragement, however, Chantel was largely on her own trying to navigate the waters of college admissions and financial aid. Being resourceful, she found the Federal TRIO Program and got connected immediately. Through TRIO Chantel was provided a personal advisor to help her with her admissions applications, FAFSA, and scholarship essays. With a lot of hard work, Chantel started a five-year program at the University of Georgia in 2016 with funding from several scholarships. In the morning Chantel would drive a bus, and then she’d take classes in the afternoon. In the evening she would go to work at FedEx. Chantel was on the phone with her mother when she received an email notification from Scholarship America. Chantel opened the email anyway and read “Congratulations.” She screamed and started running around the TRIO offices showing her advisors the email on her phone. The whole office celebrated. “My mom was on the phone the whole time wondering if anyone was going to tell her what was going on,” Chantel said. Thanks to the Dream Award, Chantel can focus on earning her dual degree in mechanical engineering and business management with the laser focus and determination for which she is known. One day, she hopes to become an engineering manager and eventually work up to CEO.